The hubpages profile has been completely revamped, and there's loads of cool looking goodies on the new one that's soon to be rolling out. This news comes straight from the hubpages blog, where Hubpages Elite Simone Smith gets into the details as to what its all going to be about. Its quite a spectacular addition to our whole new hubville here, and all of us are soon to be seeing this awesome new upgrade, and we all will get the chance to make the official transition very soon. 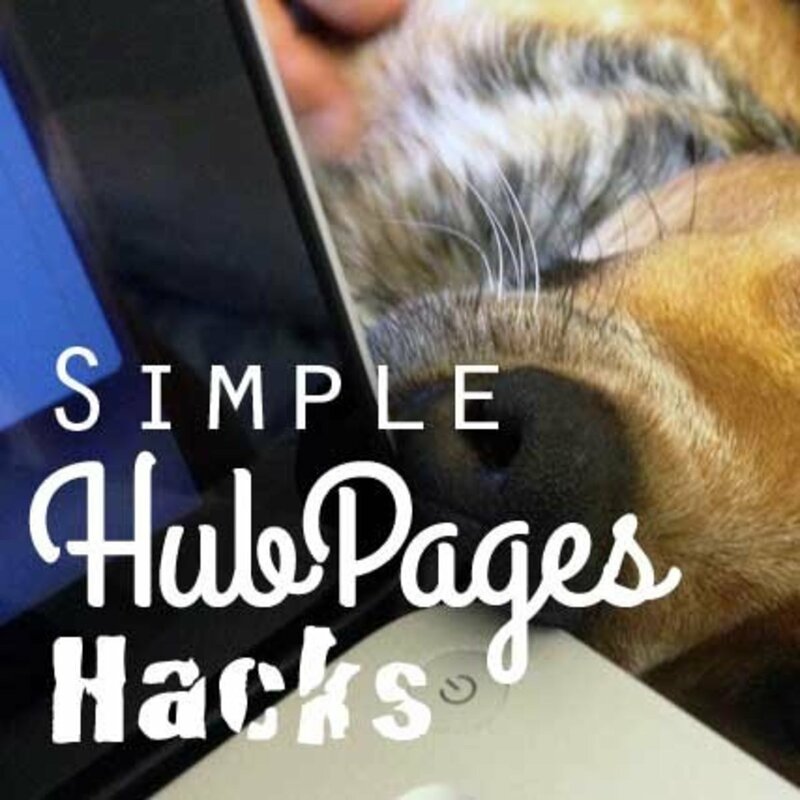 For those recent new comers to hubpages, it may come to them as a shock, but to those hubpages veterans who've been here for a long time, and have been experiencing many of the changes all along, they're much more use to this sort of thing occurring from time to time. Heck! the hubpages team of staff members are full of awesome surprises for us all, which makes it super fun and exciting to be a writer here today. We all need to thank them for working so hard on it all, and for making us writers on hubpages stand out. Thanks from all of us to you, and I will write a special thank you hub for all of your efforts, for I know you did for us all as well as for the sake of hubpages to keep up and be much better in this new age of online everything. We will now have the ability to change our profile's background into a more custom designed look and feel. The changes are in stay tuned! I recently joined hubpages about 11 months ago, and its been an amazing adventure into writing thus far, and so I'm so pumped up to finally get my hubpages profile officially pimped out! There are many cool sections of this new profile to come, which highlights all of our hub performances here, hubtivity, fan area's, and many of them are so digitally beefed up its intense. Its going to make it hard for many of us to resist playing with at first I'm sure, and we may even fall in love with its super attractive appearance, let alone once the more visually talented folks get their slimy fingers all over it, in their illustrious already fun packed hubpages accounts. Once you've made the switch you won't wanna go back to the old hubpages profile, and no matter if you will lose much of the links you've placed onto it. There is many new options to choose from to share much of your networking actions though for sure. When you choose to click on these cool new optional links, the screen of your hubs contents transitions to whatever info you click on. These new changes are sure to give us all maximum exposure to the online world of web surfers, making it the most awesome update hubpages has ever done thus far. Other things to consider will be our social profile feeds, such as FB, Pinterest, Google+, and Linkedin, which all can be loaded onto this new hubpages profile, and can send folks externally to them as outbound links. This is a awesome new treat for us hubbers, thanks once again to the Hubpages Staff & awesome Hubpages web developers. Hubpages Staff of team members, and all their cool info to learn more about them, and their interesting bio's. Each section of the new profile is also set out to be much more interactive for the visitors of our profiles, making it impossible for us all not to stand out. Our hubs are being placed as the focal point of the profile starting out when the profile page first loads, with a cool area now titled My Content. We also have the options to place our most favorite hubs at the forefront and center of its page area as part of a cool new Featured Hub section, which auto scrolls across the screen. Then there's the accolades area towards the right of the screen, which is very much the same in appearance as our current profile now, but its background is all white, which brings out the importance of its appearance if you utilize a contrasting darker profile background (The background is fully customizable ). Directly under the accolades area, which is also on the far right of the screen is the optional area to switch your profiles contents to reveal actual hubtivity, following, followers, fan mail, and recent images that you either loaded onto your my account section, or in a new hub you've created recently, or else where on the hubpages network. Advice for HubPage Newbies, HOW to get others to read your stuff! @mary615, I am too Mary, but like you when I seen how beautiful these profiles appeared to me, I was blown away and had to even write this hub and a few others about it all, besides being so anxious to upgrade, which I recently done like 2 or 3 days back. Thanks for the cool comment, and I'll try my best to pay you a visit soon as well. @daisydayz, thanks for the comment up there, oh yes indeed these new profiles are sensational indeed. I always resists change, but I LIKE the new profile. Thanks for all the info. Well I for one like the change, I think the profiles look much nicer - unlike facebook updates which just eem to make things more complicated! this is much easier to navigate! 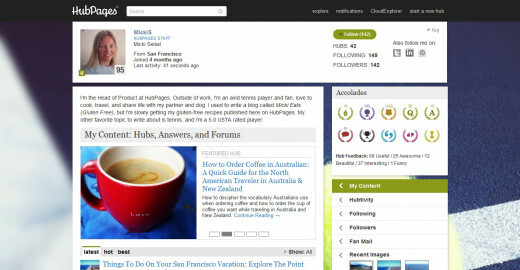 Hello @Teresa Schultz, you can add your links to social profiles on the new hubpages profile, and your allowed up to one official blog or website link, which ever you prefer. The social links are set to FB, G+, Pinterest, Linkedin, and Twitter, so those are the only networks we can share our social profiles from. Your welcome @remaniki, I'm glad this helped you out. Thanks @Gypsy for the awesome comment up above, you'll figure it out for sure. The new HubPages profiles look good, but if I read the comments beneath the HubPages blog post correctly it seems some are saying we will no longet be able to link to our own sites or own blogs from our profile page. I hope this isn't so. Thanks for the info. I didn't know about this. I would love to change my profile as soon as possible. Looks awesome. Wonder if there is anyone out there unaware of this wonderful change on HP. Sharing it for their benefit. Cheers, Rema. Voted up and interesting. However as much as all this is fantastic I still am all thumbs when it comes to things like this. I so wish it was just pressing a button and everything happens automatically. I'm probably gonna make more of a mess than good. lol I don't even know if I have the courage to try. Really me and technology. lol Perhaps if I view your video at least a dozen times. Thanks for the visit and the cool comment @Pamela99, its such a cool thing isn't it, I also love these cool new profiles. I think the new profiles are exciting and I appreciate your explanations. This hub is very helpful. Thanks. Your very much welcome @Suziecat7, the new profile updates have arrived actually, and check mine out, it may give you the option to make the new switch. I got mine done today by visiting Josh3418's new hubpages profile, and so it is here and its awesome indeed. Thanks for the cool comment. Looks like it will be great. Thanks for this Hub. Thank you @Marlene, oh yes it is I just can't wait to get to adjust my profile, its going to be super fun indeed. Clearly, HubPages is getting it right with the updated profile page. Thank you for outlining the features here. I can hardly wait to get my "slimy fingers all over it." Cool stuff happening here, for sure. Thanks @dwachira, yup it is going to look fabulous, I just hope it all can help us gain much more notoriety site wide overall. We will see in due time for sure. It looks like the new Hubpages interface will be really stunning. The ability to add and customize a background image will be awesome. Voted up and interesting. Thank you @Mary615, for visiting, sharing, and commenting on my hub here, that was cool of you to do for me. Thanks for taking the time to do this Hub. I had read the blog from HP. I need to go on my profile and update it a little, I guess. Thank goodness it isn't HP Staff. Thank you for the clarification. Oh sorry about that, "We" up there, refers to all of us hubpages account owners, meaning the owner of a given Hubpages account, will be able to select which hub to feature on that cool new section on their own hubpages profile, which is now known as "Featured Hub". Who are the "WE" who select the hubs you speak of above? Thank you @I Am Rosa , so happy to have met you here, and I'm glad you are enjoying the great news, I was fascinated myself when I learned of it all, and had to publish such a hub as this. This is awesome news, especially for those of us who use specific branding. Thanks for the head's up. Can't wait to start on this. Wow! now that's even more sensational, cool stuff Tina. I been checking out your profile, I know your a very proud mom, and your husband and son have served our country well for sure. I was in the US Navy and so I understand what you've been through and currently going through with your son being in the Army. I will definitely get into reading your hubs, you seem like such a nice person indeed. Chat with ya soon. Hey there @Tina Truelove, now that's one cool screen name, nice I see you have a way with utilizing cool names. I'm definitely going to give your hubs a try as well, I'm assuming your creativity is pretty high as well when it comes to hubbing. Thanks for the visit and for sharing. Well it is important for us to try and share it all for greater visibility you know, maybe they wanted to see who would give writing a hub about it all a try. Who knows, I'm just happy to be getting the new facelift, hehe! hanks again for sharing @Lathing. Thank you for the information. I don't read the blog much and I rarely visit forums so I did not know about this change. @LaThing, yup that where I found it too, your welcome and thanks for visiting and sharing with me. @ChristyWrites, thank you for checking out my hub, yeah people are definitely going to have fun with that cool customizable background area of the new profile. Thanks for bringing to light all of the features to come. You are right that we will be playing with the features to begin with. Is there a date marked that this will be begin? @mandarmk9, oh yes indeed it is, thanks for the compliment. Thank you @shalini sharan, I'm happy you like the hub. These hubpages profiles are pretty slick aren't they, man oh man I can't wait! Your welcome @MelChi, thanks for the cool visit, oh yes indeed this profile thingy is looking awesome. Oh almost forgot, its nice to meet you on hubpages, see you soon in your hubs as well. @sgbrown, thanks for the visit, I just found out about it a few days ago as well, I'm trilled. Wow!, i can't wait for the new profile, look like it is going to be awesome. Thanks. Thanks @unknown spy, I'm glad you like my hub and yup them profile changes are spectacular indeed. @RTalloni, Thank you for the cool visit & for sharing. @Julie DeNeen, Thank you for trying my hub here and for visiting, nice to meet ya. Thanks @Tammy for the visit, I love these new profiles changes. Wow Mike, this is awesome information. Getting a profile page tailored to one's liking even if it is the background is a cool idea. Mike thanks for making information available as always with your personal touch. I adore it. Voted up, useful, interesting, beautiful, awesome....I need some more buttons man! This sounds awesome! I had not idea anything was in the works. Sounds like I need to read the forums more often! I can't wait until the changes are here. Thank you to everyone who is involved in the new look! Cloud, thank you for this..i think i've been waiting for the it since i read it on MickS' blog. i know hubbers will gonna love the new design. Thanks for this positive look at the new profile pages! Wow! I had no idea this was in the works. I love the idea of a featured hub. This is very neat! Great hub and thanks for letting us know this. Thanks @cclitgirl for the visit, yup they are pretty cool, can't wait myself to try out them cool new profiles, and its going to be totally awesome, as a matter a fact I need to start getting my backgrounds customized and ready for the change. 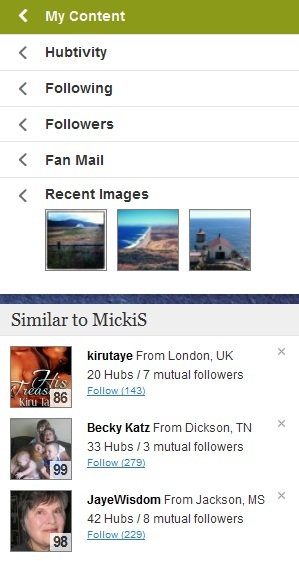 Cool - I knew about the new profiles, but I didn't know they would be so customizable! Cool! I can't wait til I can get my hands on that! :D Thanks for sharing this!! Thanks @Movie Master, for the visit and for the cool vote. Yup I just recently learned all about it myself, just figured it would be wise to spread the word a bit. Hi Mike, this is exciting news! Your very much welcome Mhatter99, thanks for the visit and comment bro. No doubt Ash, I seen the initial new profile updates in May as well, and back then I thought to make a hub about it, but there wasn't enough info on it all, it was just a prototype of what it actually has become today. So, I simply quit the idea, but then yesterday night I visited the hubpages forum by chance, and walla there it was Simone Smith created a cool forum posting that lead to the hubpages blog, and I located the cool new profile from there from off a few of the new Staff profiles there. I just had to write this after I seen it, and so there ya go, my path to least resistance to a brighter new hubpages profile, and the inspiration to write it was the beauty of them. Thanks for the great preview, CloudExplorer! It's nice to have an advanced scout like you helping us out through your reconnoitering maneuvers. Yes, I'm looking forward to this new and dynamic profile page. It's already got my head spinning with possibilities! I was blessed to stop by and read this very interesting article. Voted up, awesome, interesting, and useful! Shared as well! Great job...I knew about it but it just didn't occur to me that it could be so useful to people if made into a hub. That's why you're fantastic, Mike...Keep up the good work. @ashish04joshi, thanks Ash for the kind words and for sharing with me. I'm doing my best to help inform everyone of everything and anything I learn of that's relevant to us all, you know and its the least I can do for us all. Hello @marcoujor, I'm happy you liked my hub here on the new profile changes coming up, and thanks for the compliment on my voice, that was sweet of you. The funny thing is, I always wanted to become a professor, and maybe some day, it is one of my highest goals in my life I would love to achieve. Awesome hub for many who don't know about this latest feature yet. As someone who doesn't follow the forums too much, I truly appreciated this helpful tutorial on the upcoming changes to our profiles. I can absolutely see you as a university professor... as you have just taught us beautifully. Your voice is fabulous, understandable and engaging. The work you put into this hub is most evident. Hey josh3418, Thanks for the cool comment bro, and your very much welcome. I just learned about it last night myself, and I figured why not do a quick hub on it and video as well, I hope everyone likes it, see you soon as well bro. Your welcome Bill, its tough to pump these type of hubs out, but its well worth it though. I'm happy you dig my hub here, I hope others feel the same as well, see ya soon bro in your hubs as well I been working intensively lately so its not easy, you know. Thanks for this awesome review of the new profile buddy! I had no idea about this change, but now I am excited! You are a writing machine; more than that, you are a respected teacher who helps each of us daily with your informative hubs. Thank you for this great information; love the video and enjoy seeing you. @lorlie6, Thanks for you comment as well, and for visiting me here I love the new format to. 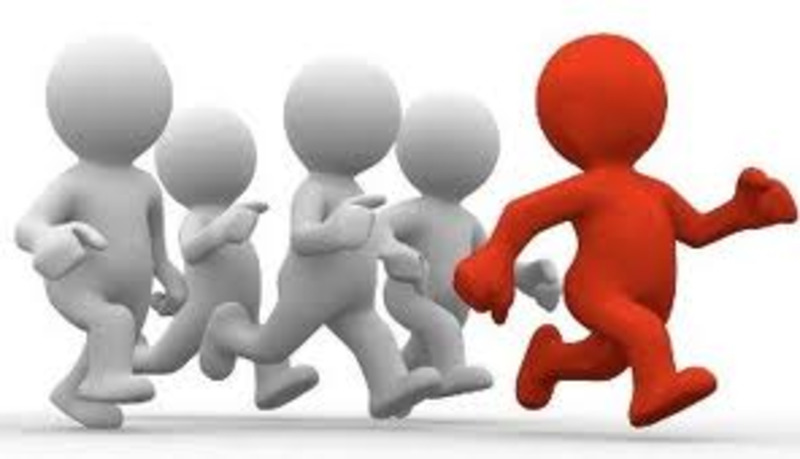 Thank you for the cool comment and visit @peoplepower73, I was blown away by this cool new hubpages profile myself, and cannot wait either till it comes. Thanks so much for this info, CE. I truly look forward to these changes since I am not very fond of the current format! Thanks for the update. I'm looking forward to it. Voted up, useful and sharing. Thanks @Happyboomernurse, I figured why not let everyone know who hasn't yet discovered it all from off of the hubpages blog, or forum areas. Cool stuff! I love the idea of being able to select the featured hub and I enjoyed your review of the new features we'll soon be seeing on our profile pages. Thanks for sharing this info. I knew changes have been in the works for quite some time but didn't know what they would be in the final version.